Change from the A 66 at the intersection „Schiersteiner Kreuz“ to A 643 towards Bingen / Koblenz. 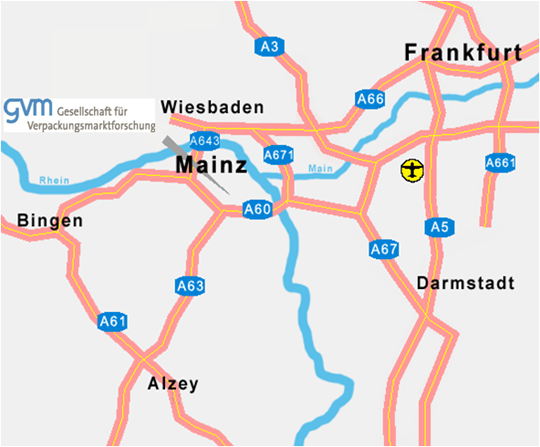 Drive until the junction „Autobahndreieck Mainz” and change onto the A 60 towards Darmstadt. Change from the A 3 at the junction „Mönchhofdreieck” onto the A 67 towards Mainz / Darmstadt. Change at the junction „Rüsselsheimer Dreieck“ onto the A 60 towards Mainz / Bingen. 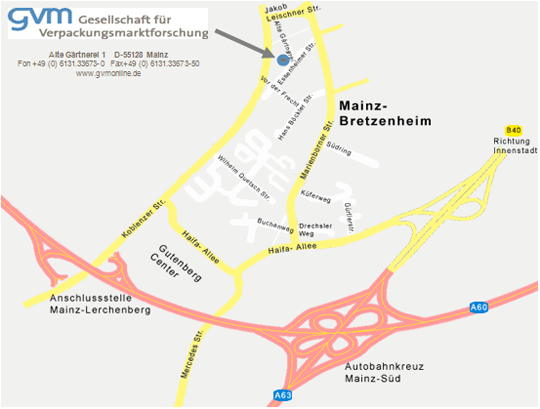 Use the A 63 until you reach the intersection „Autobahnkreuz Mainz” where you change onto the A 60 towards Bingen / Wiesbaden. Use the A 60 past the junction “Autobahndreieck Mainz” towards Darmstadt. Use the freeway exit ramp „Lerchenberg“. Turn towards Mainz city center „Mainz-Innenstadt“. After the traffic lights (Gutenberg Center) get into the left lane and continue straight ahead. After the second traffic light turn right into the street “Vor der Frecht”. Turn left immediately to get onto the „Essenheimer-Straße“. You will reach GVM on the left side of the road after approximately 50 m.
You can use various trains (RB, IC) and the S 8 from the local railway station from Frankfurt Airport to Mainz Main Station. The travel time will be around 20 to 25 minutes. For the continuation of your journey by taxi or bus use the descriptions below. Use bus number 6 towards Bretzenheim from Mainz Main Railway Station. Get off at the bus stop „Essenheimer Straße”. After the bus stop you will reach the Essenheimer Straße after walking 20 m and turning left. After another 200 m you will find GVM at the right hand side off the street. We wish you a pleasant journey and are looking forward to meeting you personally in our building.